Eighty-year-old Jaswantiben Jamnadas Popat defies her age. She seems more agile and active than her grandchildren. “I don’t want to stop working,” she says with youthful determination. Mrs Popat is the only survivor of a group of semi-literate Gujarati housewives who founded Lijjat Papad 50 years ago. She will be celebrating the Lijjat golden jubilee on 15 March with 45,000 other women who are part of the women-only co-operative. Mrs Popat cannot believe that what started as a desperate move to “supplement the family income” 50 years ago has come so far. She says after taking a deep breath: “I feel I am living in a dream world. When we started our business it was not meant to become so big. Papads, or poppadoms, are the traditional restaurant starter and go with dips and chutneys. They are a thin wafer of lentil, chickpeas, black gram, salt and oil. Various types of seasonings are added. The Lijjat trade began when seven Gujarati housewives decided to exploit the only skill they knew – cooking. On 15 March 1959, they gathered on the terrace of an old building in a crowded South Mumbai locality and rolled out four packets of papads to sell. The “seven sisters”, as they are fondly remembered, started production with the princely sum of 80 rupees (now $1.50), borrowed from a good Samaritan, Chaganlal Karamsi Parekh, a social worker with entrepreneurial brains. Mrs Popat pays handsome tribute to Mr Parekh’s contribution to their success story. Soon the entrepreneurship expanded in Mumbai’s overcrowded and poverty-stricken shanty towns. Three months later the business had 25 women. Word quickly spread about the quality and taste of the poppadoms. The trade began to expand as a co-operative. In a few years they had branches all over Mumbai and in subsequent years all across India. Foreign dignitaries visited their factories. The women received one award after another. Exports flourished. They were on a roll – from poppadoms they branched out into soaps, savouries, chutneys and pickles. But apart from following the advice of Mr Parekh, what is the secret of Lijjat’s success? After all there are other poppadom makers all across the country. Mumbai-based businessman and entrepreneur Sushil Jwarijka explains: “Lijjat papads are a perfect example of how a sustainable business can be built, providing large-scale employment to rural women, who are illiterate but skilled. Jyoti Naik, who runs Lijjat’s head office in a Mumbai suburb, joined the co-operative 40 years ago. She says it is the women’s sense of financial independence that has made a small enterprise into a big business. “These women work here to help raise their children and be financially independent,” Ms Naik says. Priyanka Redkar, 35, was just nine when she began rolling out poppadoms alongside her mother. A deeply family-oriented mother of two children, Priyanka exudes the confidence of a woman who knows her place in society. Ranjana Khandare was born into the Lijjat family. Hardships and extreme poverty meant she began helping her mother when she was barely a few years old. Financial independence for these women translates into empowerment. Most of the 45,000-strong female workforce live in slums or one-room hutments, with communal bathrooms and toilets. They are still part of what is known as the working class. But working for Lijjat Papads gives them financial security. They are now capable of taking decisions, sending their children to schools and keeping their men on the straight and narrow. Mr Jwarijka says it has done their self-esteem the world of good. Indeed the Lijjat women seem to have proved that success does not necessarily need money and infrastructure, as long as there is determination. The village girls chased the assailants! Indian Man who moved a mountain! The efforts are unusual and appreciating vis-a-vis it is humble sbmission if the HEADING is made more appealing people would be bound to attract.For example this inspirational presentation may be said “WHERE MININMUM IS THE MAXIMUM” or like that. 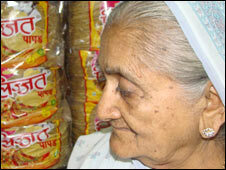 Parvatiben Thobani is the founder member of lijjat papad ans she is still alive. First lijjat papad was started by Parvatiben Thobani at her house in girgaun than later on Jaswantiben Jamnadas Popat joined them.